Today in the Alpine the avalanche danger is MODERATE where triggering a slab 1-3’ thick is possible in steep terrain. This is a high consequence "scary MODERATE" problem that is possible in terrain with slope angles over 35°. Below 2500’ the danger is LOW, where a supportable crust has formed on the surface. The first annual SNOWBALL is tomorrow, Friday Feb.22. A "more formal than normal" night of music, door prizes, raffle and fun is on the schedule at the Taproot. Please join the Friends of the Chugach National Forest Avalanche Information Center and Alaska Avalanche School in an effort to support local avalanche education and information! Tickets are one sale TODAY through Taproot Events Calendar Page. As we move away from the most recent loading event last weekend the likelihood of triggering an avalanche is on the decline. A well-documented weak layer of facets beneath a 1-3’ slab can still be found, it has not disappeared, but the stability appears to be improving with time. No new weather events have added additional stress in the last five days and the lack of obvious instability (like no recent avalanches or widespread collapsing) point towards the weak layer slowly adjusting to its load. In test pits however, we are still finding a high likelihood of propagation, and if enough force is applied in just the right spot it could initiate a high consequence avalanche. This can be a tricky problem to manage in our heads as we find snow conditions in the Alpine feeling very much like the dense Chugach powder we so often associate with a stable Maritime snowpack. Just because someone skied a steep slope does not mean steep slopes are safe. Careful snowpack evaluation is recomended; getting a closer look underneath the slab could help remind you that a weak layer is lurking below. Triggering a slab will be more likely on well-connected steeper slopes (> than 35°.) Trigger points are likely to be in thinner areas of the snowpack near rocks and along convexities of steep rollover features. Be sure to practice safe travel habits. Constantly identify safe spots, move between islands of safety one at a time, and always have an escape zone in mind. Today daytime temperatures and expected to be in the mid to high 30’s and if cloud cover or fog roll in, this could increase the insulating affect and start breaking down the surface crust below 2500’. If you find warm temps causing you to sink into bottomless loose snow, avoid steep terrain where wet avalanches might be possible. This avalanche concern is unlikely, but is worth mentioning as our thin mid elevation snowpack battles with spring like conditions. The photo below was taken from the uptrack at Seattle Ridge yesterday as a dense valley fog began lifting late in the afternoon. Yesterday a thick valley fog burned off later in the day and winds were calm. Temperatures were in the mid 20’s F most of the day with a spike mid day in the low 30’s F at mid elevations. Overnight temperatures dropped into the low 20’s F. Ridgetop winds were 10 mph out of the Southwest on Seattle Ridge. No new precipitation was recorded in the last 24 hours. 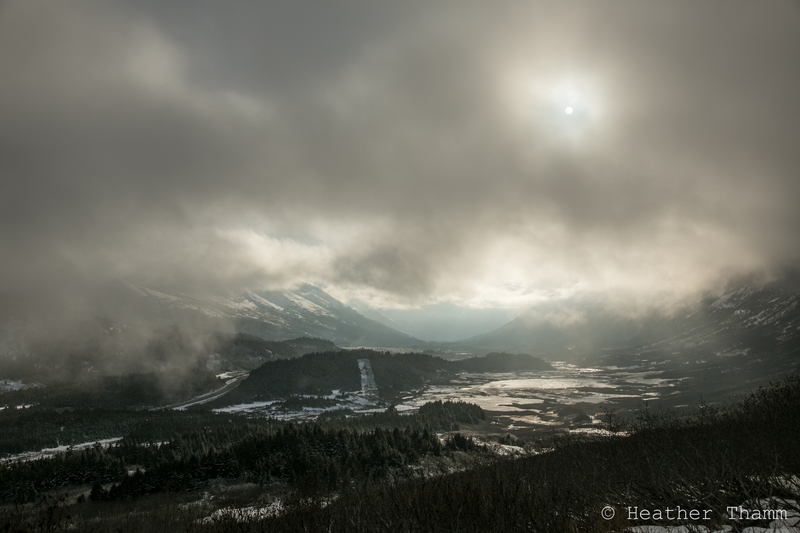 Today skies will be mostly sunny at higher elevation, and patches of valley fog are likely along Turnagain arm. Temperatures will be warm, in the mid 30’s F along ridgetops, with light to moderate winds out of the Southeast. Tonight cloud cover should move in and temperatures look to remain warm throughout the evening. Our next chance for precipitation is Friday night into Saturday as a low-pressure system tracks in our direction from the Aleutians.